Some myths die hard. No matter how many times you debunk them, they keep getting resurrected. 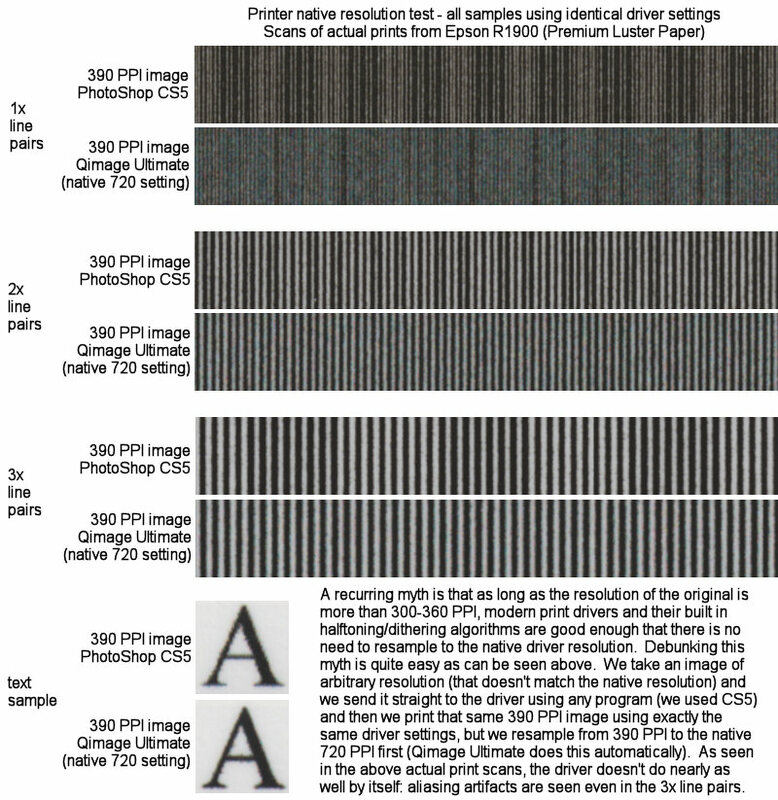 In this article we'll (re)debunk the myth that native printer resolution (600 PPI for HP/Canon and 720 PPI for Epsons) doesn't really matter as long as your image is more than about 360 PPI (though the actual number in the myth often varies between about 300 PPI and 360 PPI). Have printer drivers really improved over the years? Are today's drivers good enough at dithering/halftoning that there is no longer any improvement realized by resampling up to 600/720 PPI prior to sending an image to the driver? This is a pretty easy thing to test so let's take a look in what will be my shortest article to date. Why so short? Because a picture is worth a thousand words. The argument (of the myth) is that as long as your original image has more than about 300 to 360 PPI, modern drivers are smart enough to be able to lay down the ink dots such that there is really no gain by upsampling. The myth states that the driver is already doing halftoning (dithering of the dots) so upsampling to the native resolution of the driver gives us no benefit. As always, debunking this decade old myth is as easy as sending some tests to the printer and evaluating the results. Since the camera that took your photo can have any number of pixels and since you can choose to print photos at any size you like, it is best to use an "out of sync" resolution to test the myth. Here we take a 390 PPI image (because 390 PPI is not a factor of either 600 or 720 PPI) and we print it straight to the driver and compare the results to the same 390 PPI image resampled first to the native driver resolution and printed with identical driver settings. As can be seen in the samples below, Qimage Ultimate, which automatically resamples to native driver resolution, does a much better job at resampling than the driver and eliminates much of the artifacts (aliasing) caused by the driver not having the best resampling algorithm. Skeptics might say I'm just trying to sell you a copy of Qimage Ultimate which takes care of all the native resizing automatically by utilizing technology based on years of driver optimization research. So don't take my word for it. Try it for yourself. Download this file and print it at any size you like. Try a variety of print sizes. The above was printed at 6.767 x 3.935 to give us the 390 PPI but you can print a variety of sizes and compare. You'll always get better results (finer detail and fewer aliasing artifacts) by using Qimage Ultimate and letting it resample to the native driver resolution. Remember that you change the original-PPI each time you print at a different size: the smaller you print, the higher the original resolution (PPI) that you are starting with. Once you pick a size, simply print at that size in your favorite photo editor by first opening the test image and then choosing the print size you want in the print dialog (do not resample or change the resolution). Then do the same thing in Qimage Ultimate by locating the same image (thumbnail) and printing it at the same size. Qimage Ultimate will resample to the native driver resolution and if the test is done properly, you should see that you get better and more consistent results that way. I did the test with Qimage Professional and got results similar to yours. Resized image to 390 ppi and printed from Photoshop on an Epson NX400 (Photo RPM on Premium Photo Paper Glossy). Then printed from Qimage with 390 ppi, same paper/printer settings. The results were just as you show above: Qimage did a much better job on all tests, but was most noticable on the "lines" images (A). I mistakenly printed first with Sharpen set to "3", but got much better results with Sharpen set to "0" (not surprising). Seems like old (or even new) myths die hard.